Here are some good quality photographs of the streets of Beijing with a fair amount of detail which give a feel of the city. 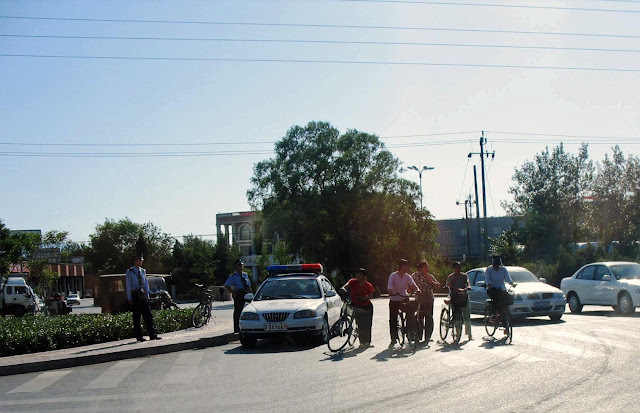 In the first photo you can see a group of cyclists waiting at a traffic signal. 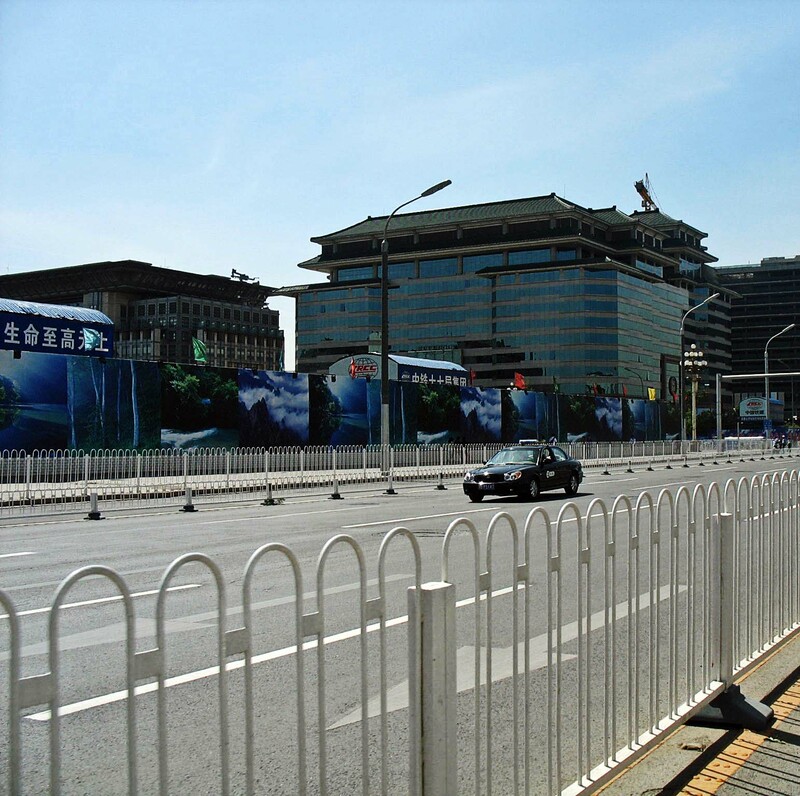 To the left of the image there is a police car with two Chinese policemen standing outside it. 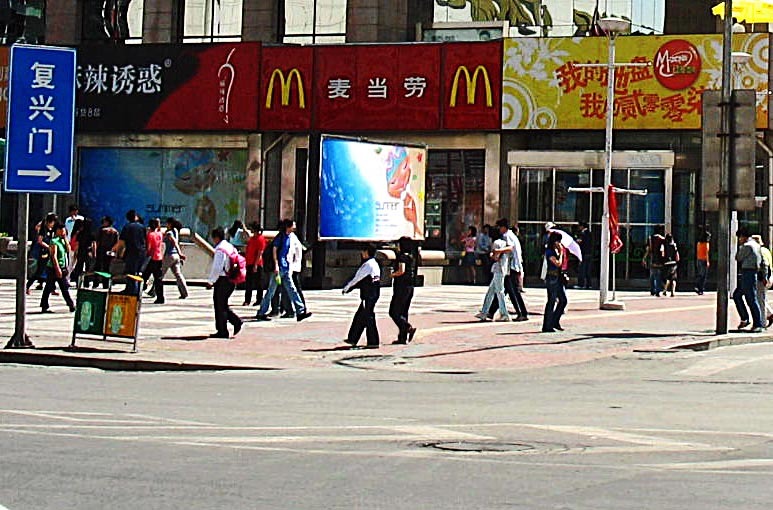 The second image is of some people waiting to cross the road. There is a woman with a shopping bag and some young, smart girls. 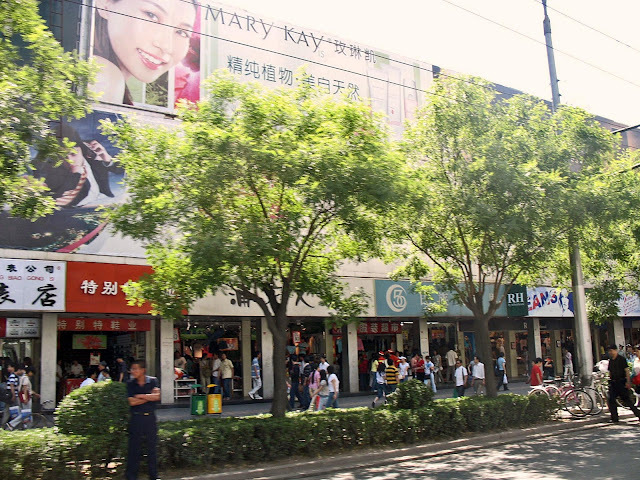 There is a shopping centre in the background and a young couple laughing and talking on the road in front of it. There are also taxis and buses. This photograph was shot from across a white railing. A lone car can be seen on the broad road and there are some buildings in the background. Some construction work seems to be going on but the ugliness is hidden from view by pretty billboards. This is a main thoroughfare in Beijing with important buildings and commercial complexes to the left of the picture. Cyclists can be seen on a road with hardly any cars. 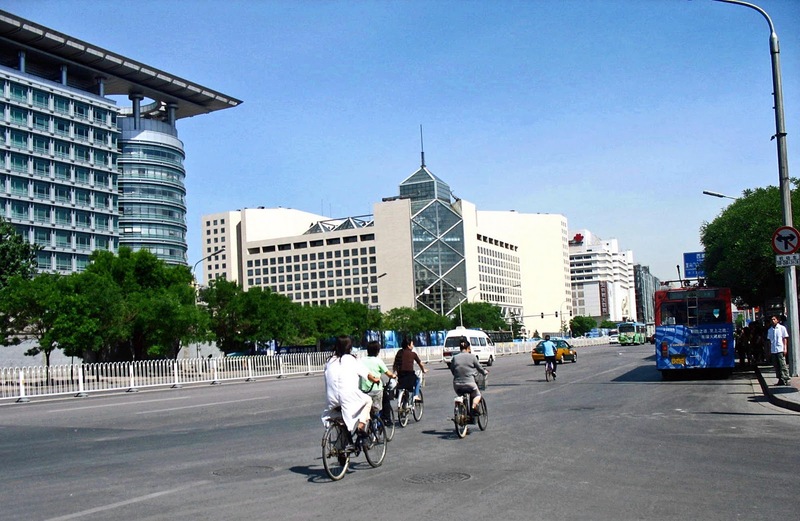 Cyclists are a common sight in Beijing. A bus can be seen at a bus-stop to the right of the image. This is a mall in Beijing, the wall of which are adorned with advertisements and cinema posters. Smart young people can be seen on the pavement outside the mall. 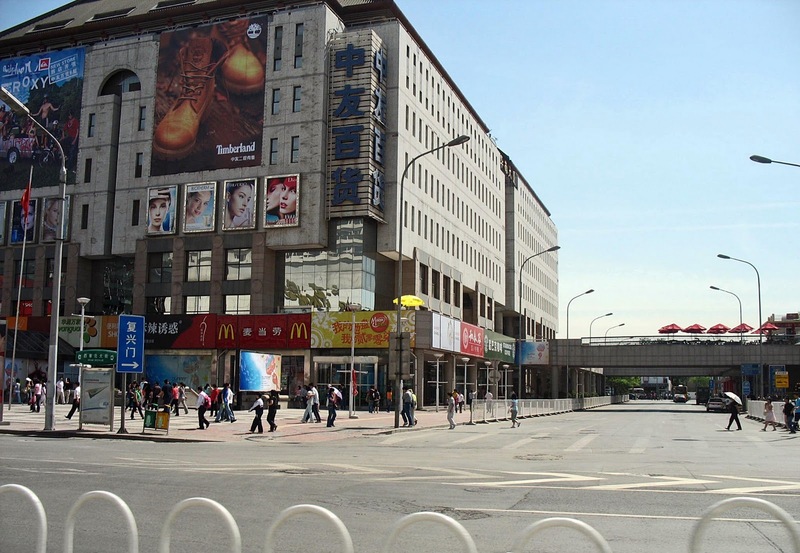 MacDonalds restaurant is on the ground floor here. The photograph shows a fair amount of clear details. This is a closer view of the pavement and MacDonalds restaurant in front of the mall in Beijing. Two trash cans can be seen in the picture at the bottom left. Notice the number of young people on the streets. 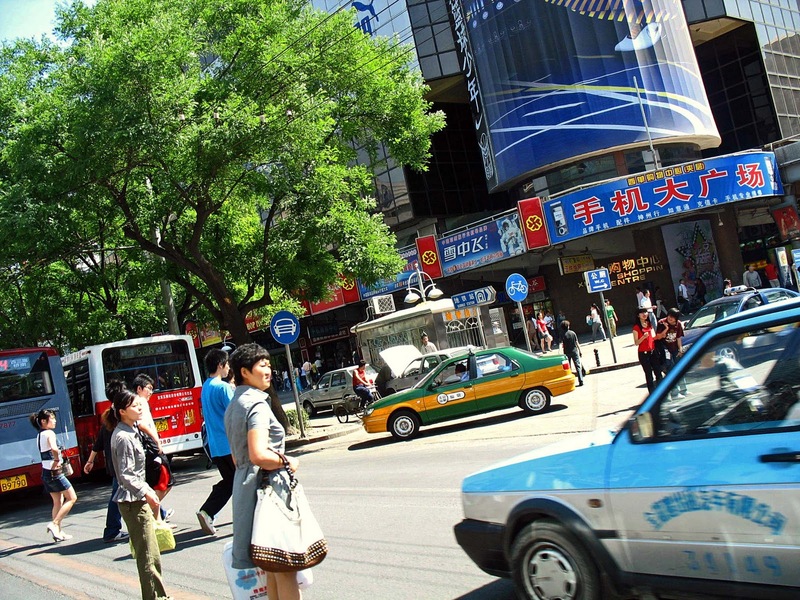 In China most people wear western clothes, whether poor or rich. 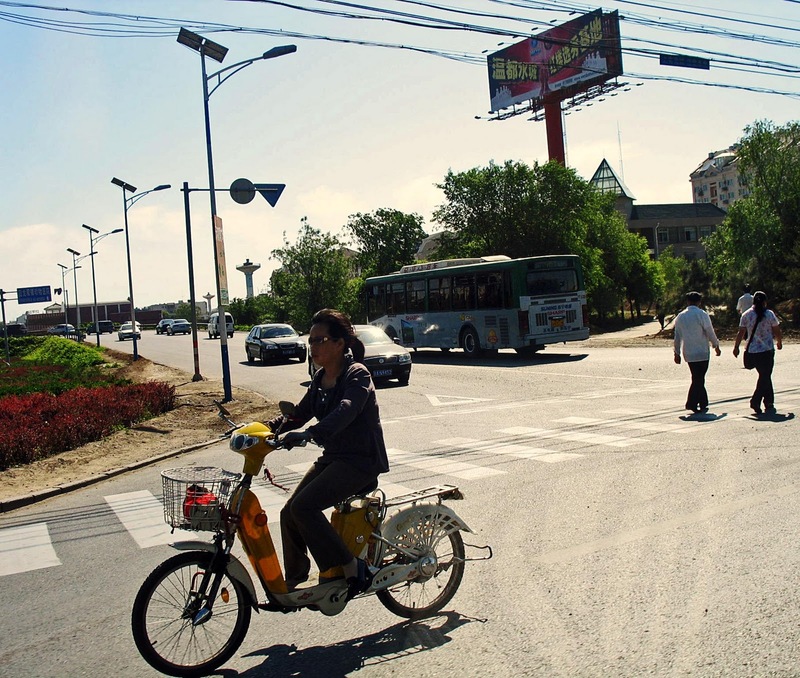 In this picture there is a woman on a moped or motorised two-wheeler. One rarely sees mopeds or scooters in Beijing. Other traffic like buses, and four-wheelers can also be seen in the picture. Here you can see a tree-lined pavement with people walking and some cycles parked at the edge of it. It is a shopping area. On the top of the buildings there are advertisement hoardings or billboards. or Tiananmen Square in China or Hong Kong Skyscrapers or check out the label "China" for all the photographs on this country including that of people, tourist places, and important monuments. These are photographs of workers who are dangerously perched several storeys high on buildings without helmets or harnesses. The first picture is of a man painting an under-construction bridge. 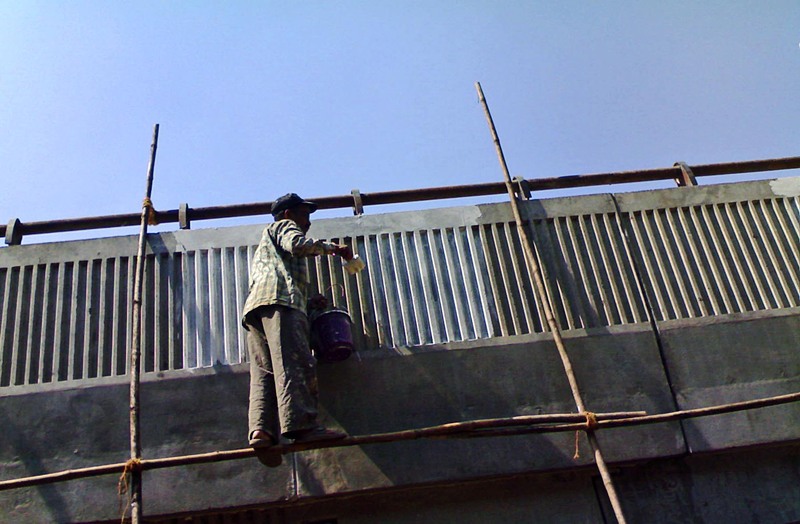 The painter is balanced on scaffolding and has a bucket in one hand and a large paintbrush in the other. There is nothing to hold him in the event of his losing his balance and neither are his hands free. The only thing that saves him everytime is that he is fairly young and used to this type of work. 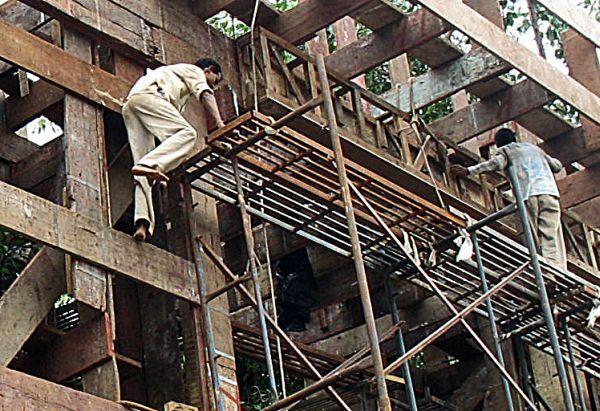 Although there are rules that forbid people from working without safety gear, not everyone follows them. 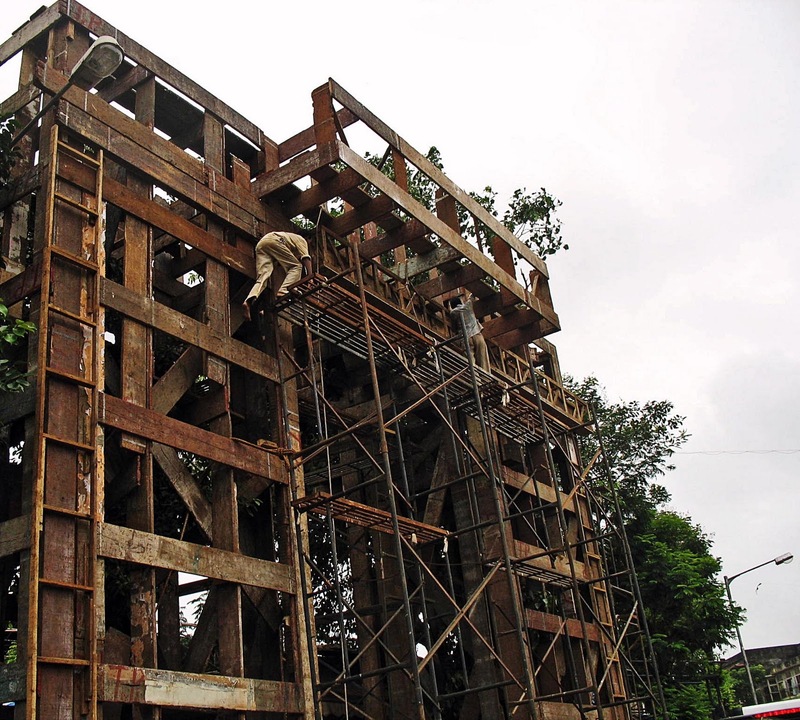 In this picture you can see two workers putting up a temporary structure during the Ganpati festival. The worker on the left has climbed up with alacrity without any fear of falling. He has no helmet and nor does he have proper footwear for safety. One has to wonder how the man has even reached this height as there is no crane or staircase in sight. This photographs gives us and idea as to how he reached the place. He has climbed in through a gap in the wooden temporary structure. 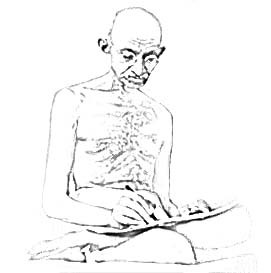 These are sketches or pencil drawings of Mahatma Gandhi's photos and portraits. 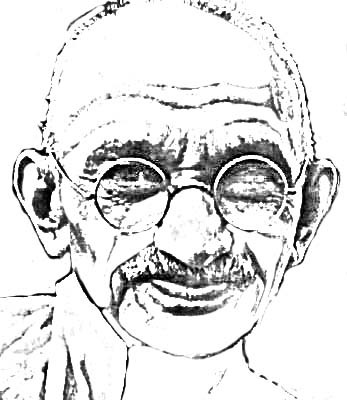 Mohandas Karamchand Gandhi (MK Gandhi) was the prominent leader during India's Independence Struggle from British Rule. 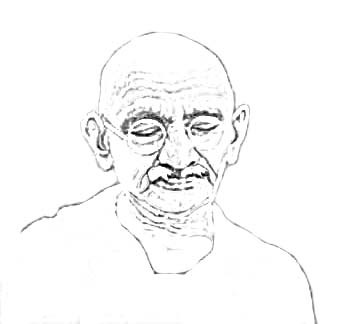 He believed in non-violence and used methods based on this idealogy to fight British Imperialism. In this drawing, MG has an inquiring or even puzzled or sceptical expression on his face. He is wearing some cloth on his right shoulder. Here Gandhi seems engrossed in writing something. He is sitting on a mattress. He is bare-chested and wearing a dhoti. 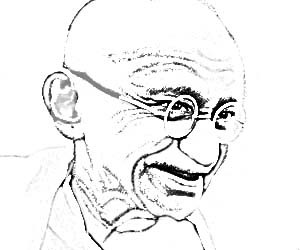 In this one Mahatma Gandhi has his eyes closed. He has covered himself with a shawl. In this photo Mahatma Gandhi is laughing or grinning broadly. This picture is on some Indian currency. 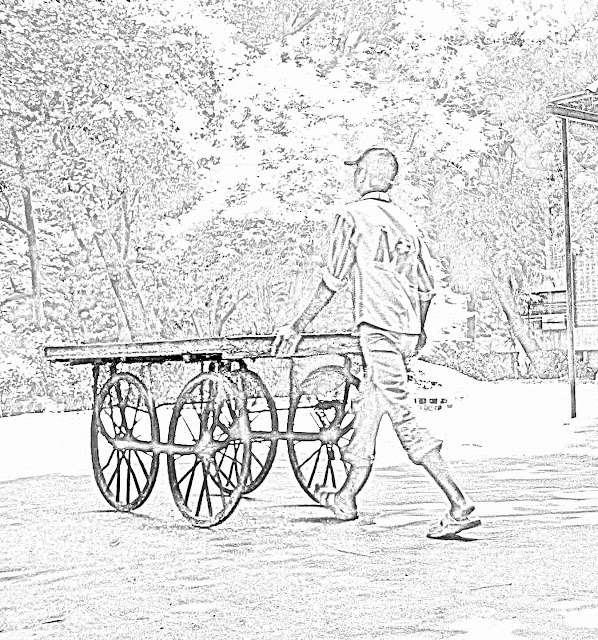 (These sketches are based on copy-right free photographs available in the public domain and have been made by me on the software Photoshop). 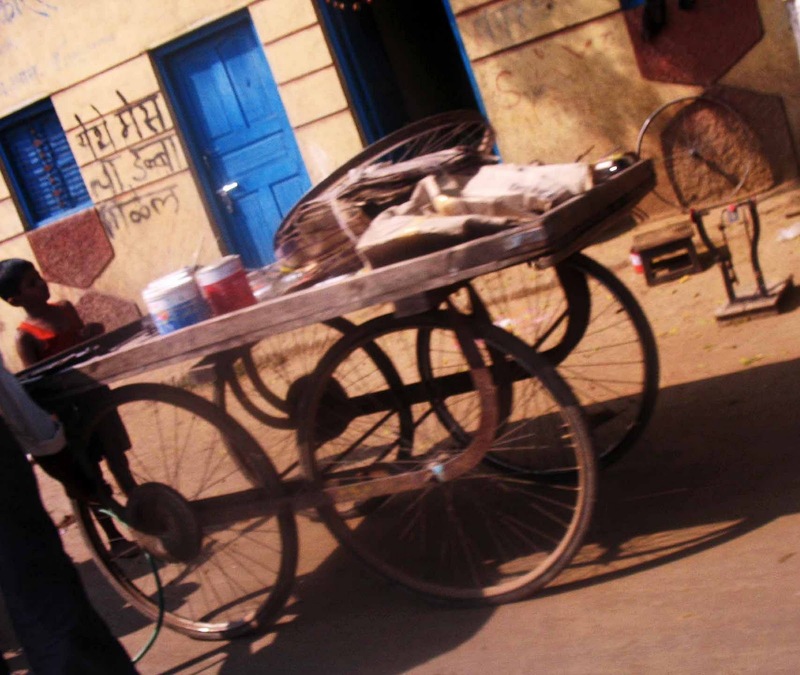 Four-wheeled handcarts are common across India and used for a variety or purposes. 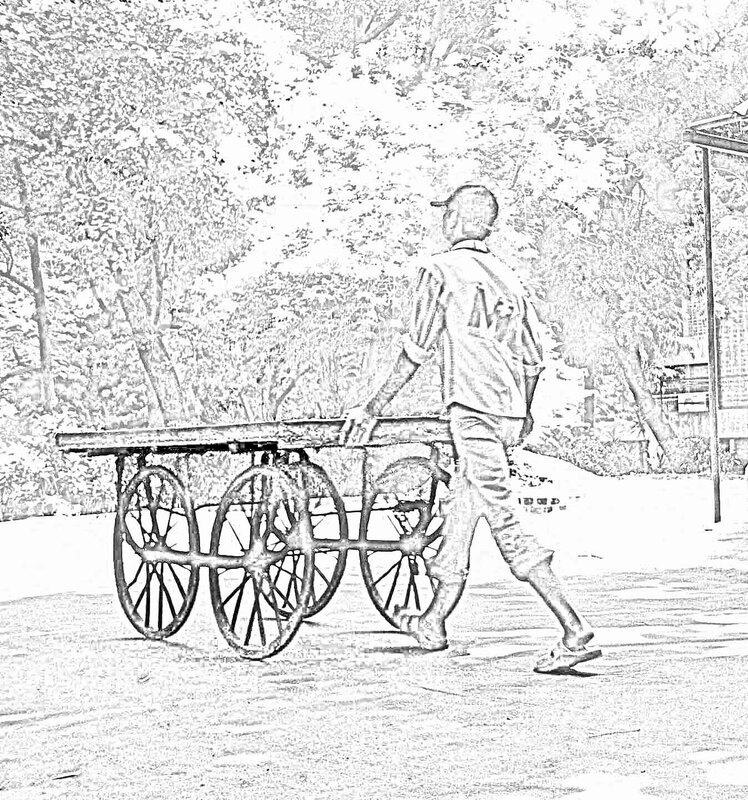 For transporting goods to selling wares. Here are a few photographs of these hand-carts. The first picture is of a hand cart selling coloured drinks, most of which use banned colours. The vendor doesn't seem to be around. To the left of the picture is a cobbler. An umbrella protects him from the heat of the sun. The picture was taken on a hot summer's day in Pune and the photo is a little over-exposed. Another photo of a hand-cart selling drinks on a hot day. 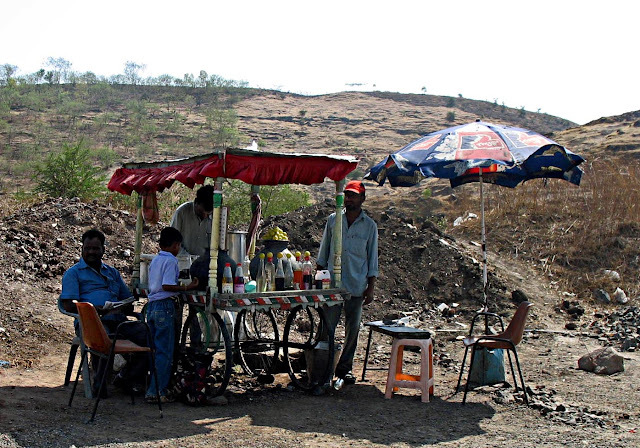 These people appear as if they are in the middle of nowhere, but actually they are near the highway on the outskirts of Pune. You will see lemons displayed on the cart, and this is used to add taste to the synthetic drinks. These drinks are cheap, and it is mostly the poor who buy them. You can see a small boy purchasing a cool drink. 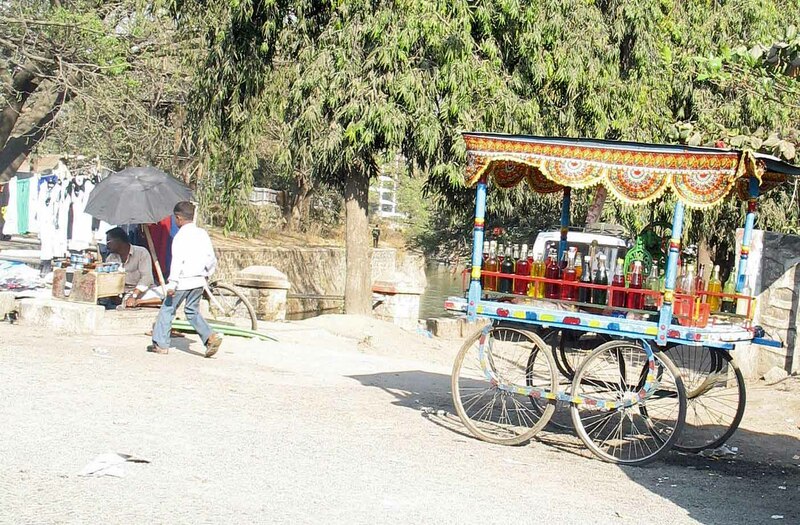 This cart also has a matka or an earthern pot which cools the water. No need for refrigeration here! 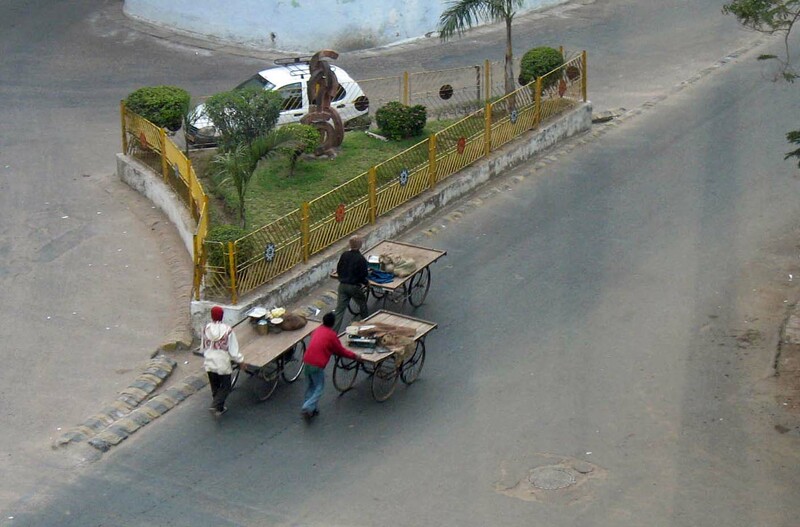 The photo below is of three hand-carts spotted from a hotel window in Ahmedabad city. It's a bird's eye view of hand-carts and men pushing them. This is a photo of an overturned hand-cart. It is on its side, with the wheels visible. It's been deliberately overturned so that it occupies less space on the road. The next two photos are not of a high resolution and should be used only in the size shown in the post. 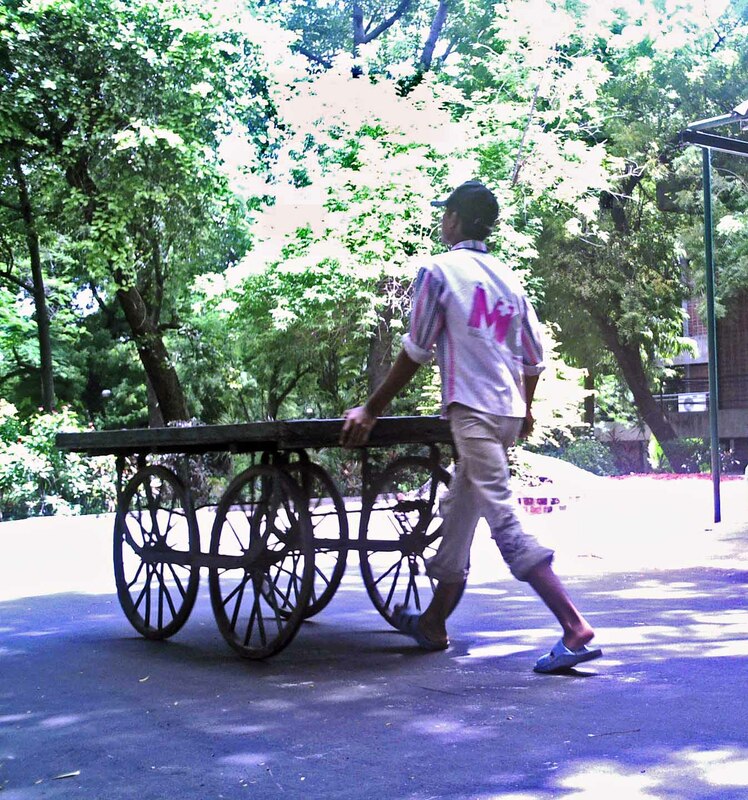 The one directly below is of a young man pushing an empty hand-cart in Ahmedabad. Here is a sketch of the same photograph. This is the same sketch without the background. 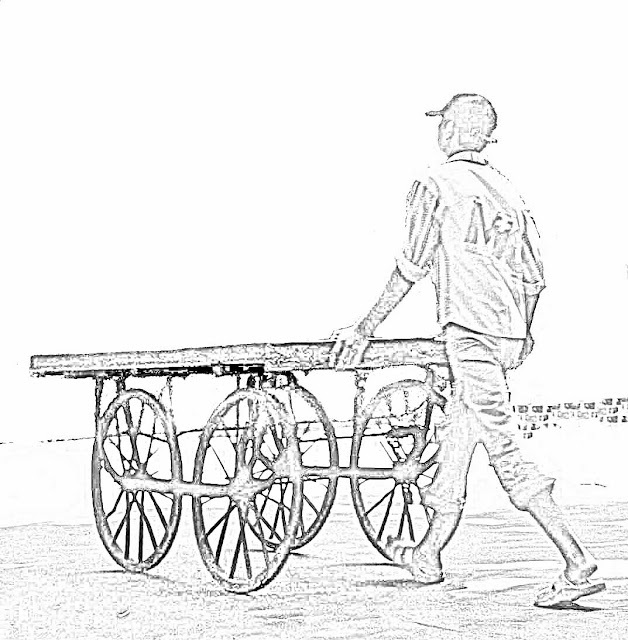 The photograph below is of a little boy pushing the hand cart which seems to have some junk on it. 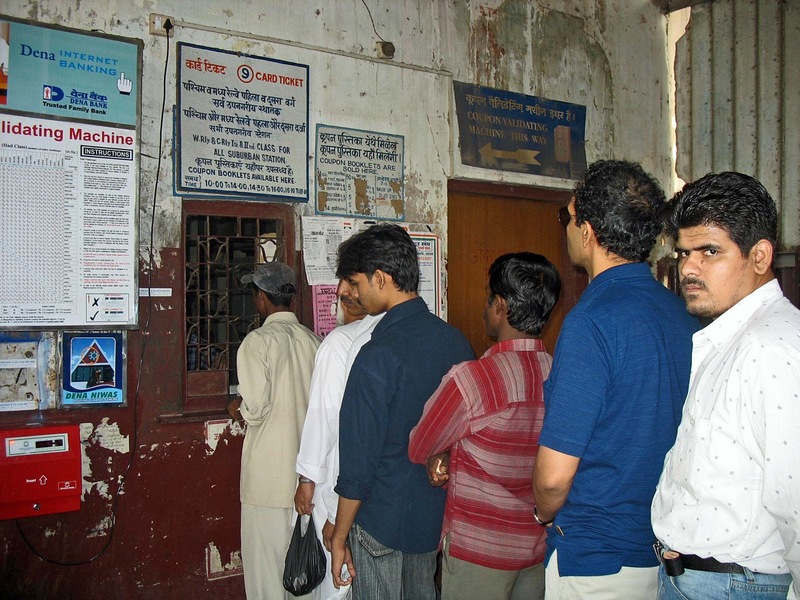 These are photographs of people in a queue to buy railway tickets and coupons for suburban trains in Mumbai. The place doesn't look very clean. The walls are unpainted and the window small and inconvenient to approach. The person at the counter is taking his time but people wait patiently for their turn. Those who already have coupons can use the coupon validating machine, which is to the left of the image. This is a closer look at the line and the ticket counter. 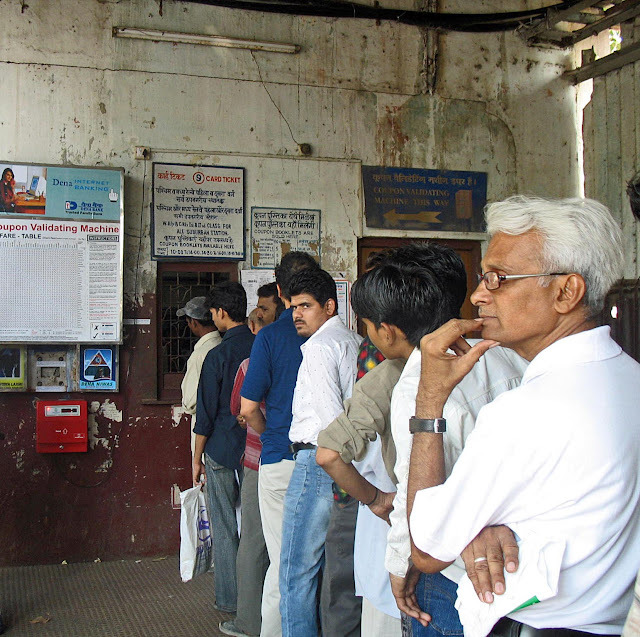 For railway station interiors and exteriors: Mumbai suburban railway station pictures or the heritage building of VT or CST railway station in Mumbai or photos of a platform at Mumbai Central Railway Station. Also: Coolies from a Mumbai Railway Platform. 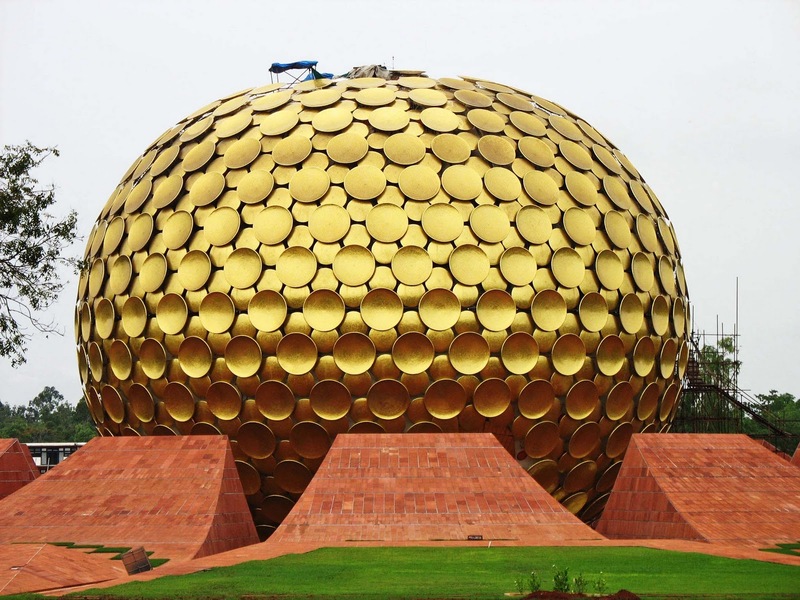 These photographs are of Auroville, in Puducherry, Tamil Nadu, India. 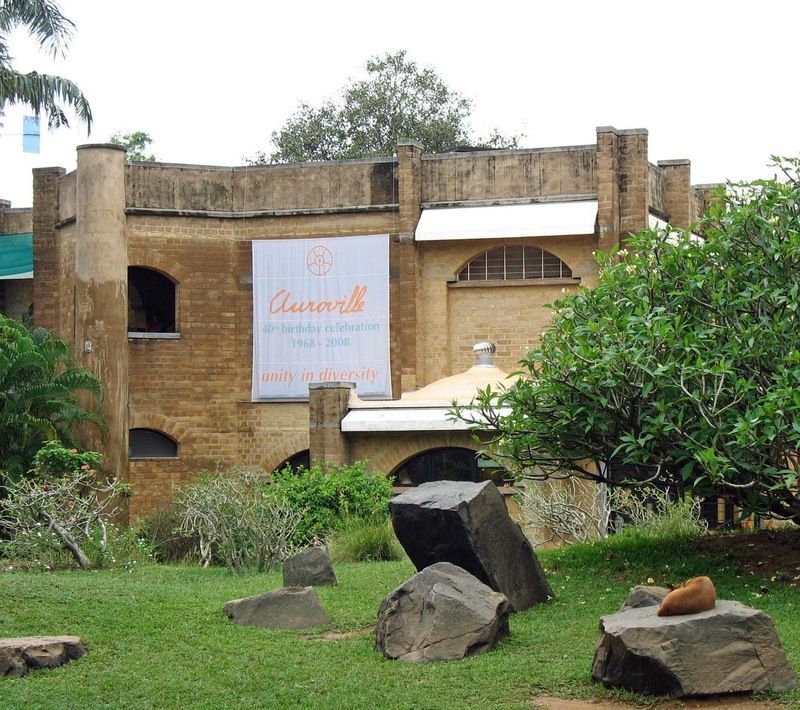 The first one of the main building which houses the offices and the halls, and the second picture is of their meditation or spiritual centre, Matri Mandir. It is a domed structure, with a crystal sphere in the meditation room. 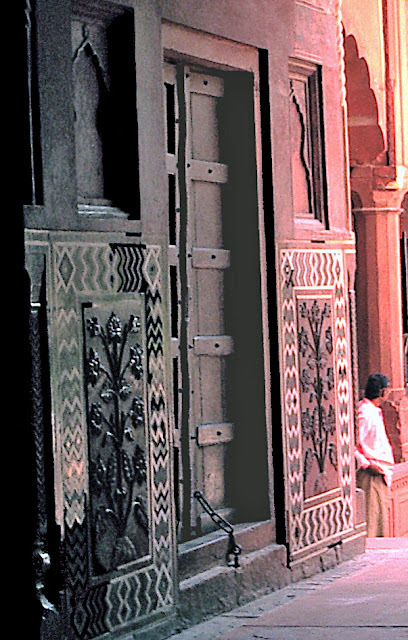 Ordinary tourists are not allowed into this "mandir". The top of the dome had some repair work going on when the photo was taken. 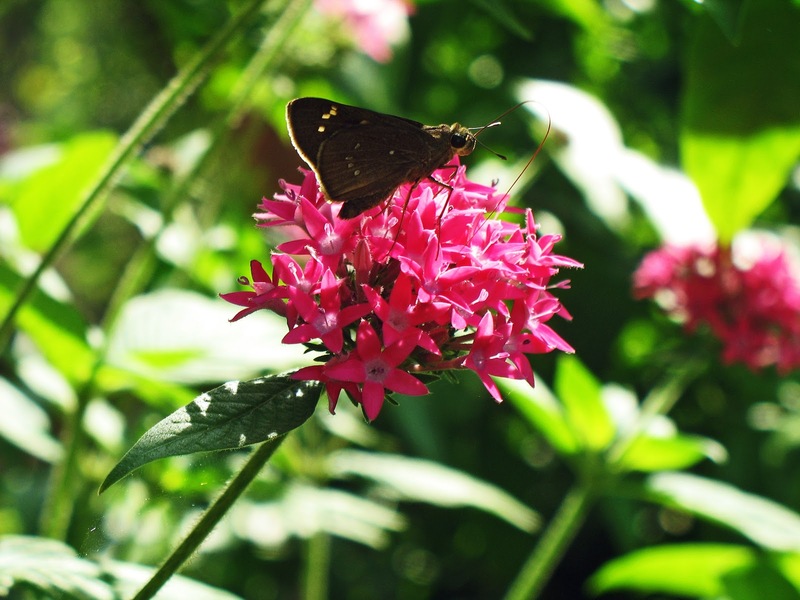 These are some images of a brown butterfly feeding on tiny pink flowers. The soft brown coat with the tiny yellow dots is clearly visible as are the large round black eyes. The spidery thin legs are lightly perched on the petals. There is one long antenna which goes in a curve into the petals. Wonder what species of butterfly this is. 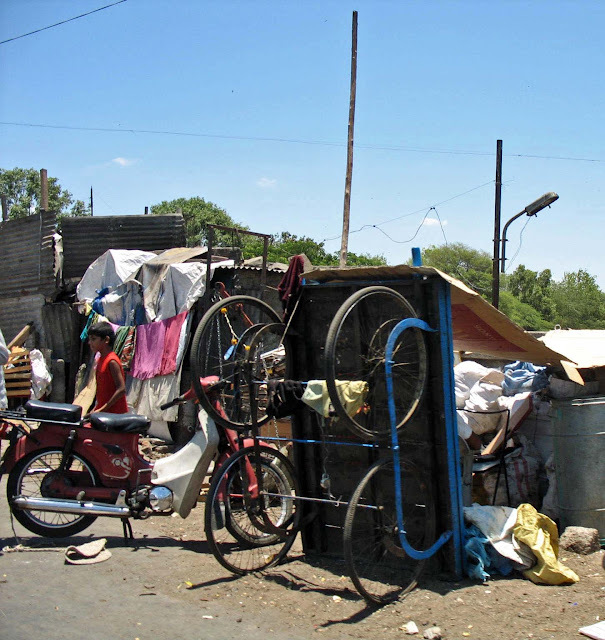 The photograph was taken in Kamshet district in Maharashtra, India. 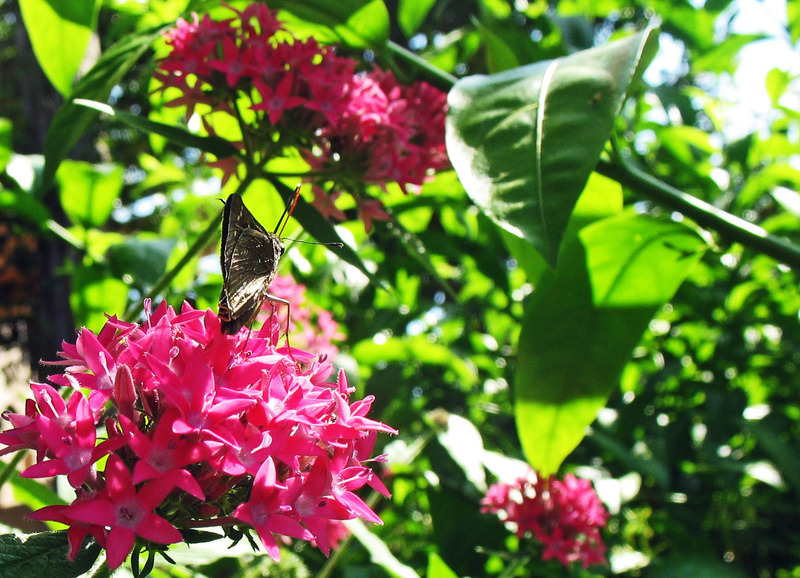 In this picture the butterfly can be seen from the side. It looks almost human or at least some kind of alien being! The coat could well be a robe being swept in the wind, and it appears at a cursory glance as if it has just two legs. The butterfly seems to be walking on the petals. This is another image of a brown butterly, a different species. 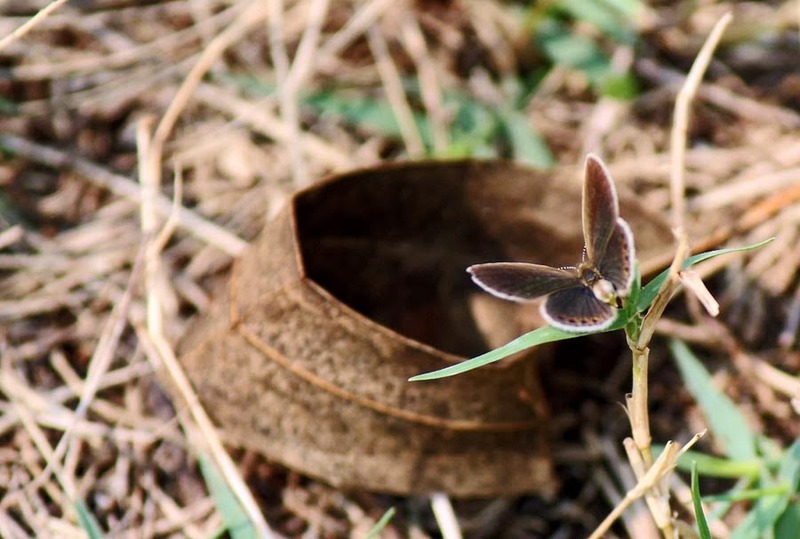 It is a very tiny one and perched on a dried leaf which is lying on dry grass. You might also like Green caterpillar images or photos of Citronella Orange Ants or Photographs of brown and black bees or for more images of insects try the label "Insects"
For images of flowers try the label "Flowers"
One of the sights to see at Jungfrau, Top of Europe, is the Ice Palace. 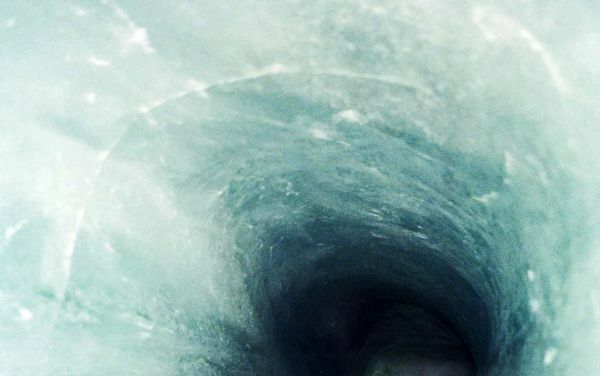 Here are a few pictures of the very slippery place! 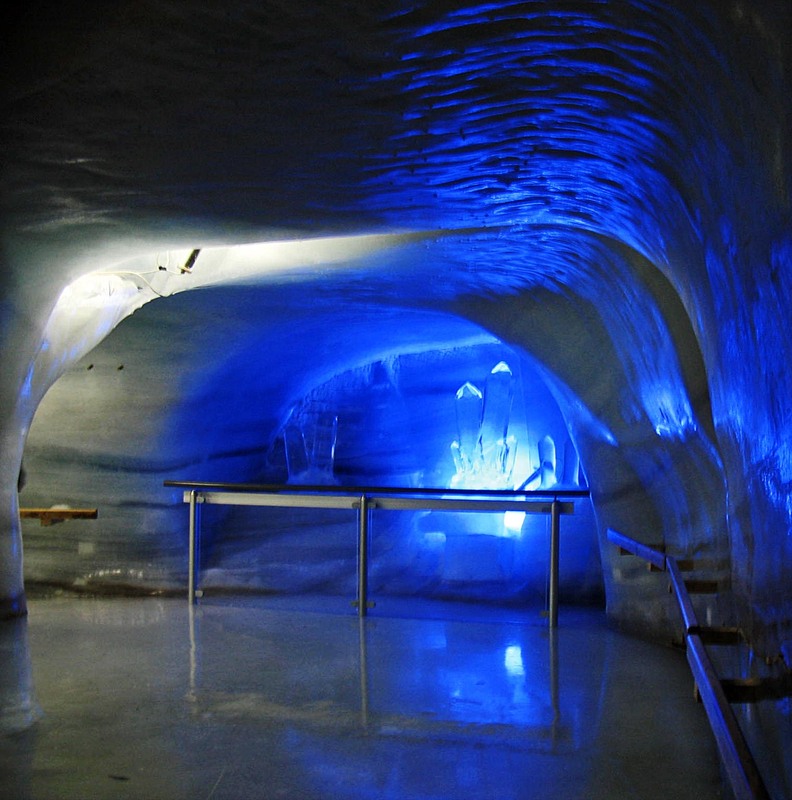 Jungfrau is a tourist destination and one of the highest points in the Swiss Alps. It is a popular tourist destination, and need not be a luxury vacation! A fair amount of inexpensive holiday packages to Switzerland and Europe are available today. 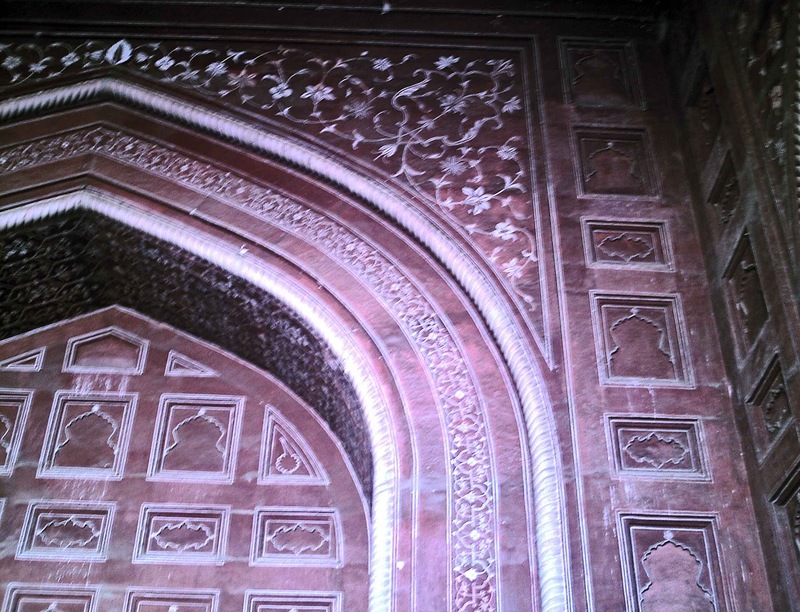 The image below is one of the tunnels inside the palace. A blue light reveals a small ice sculpture behind the railing. 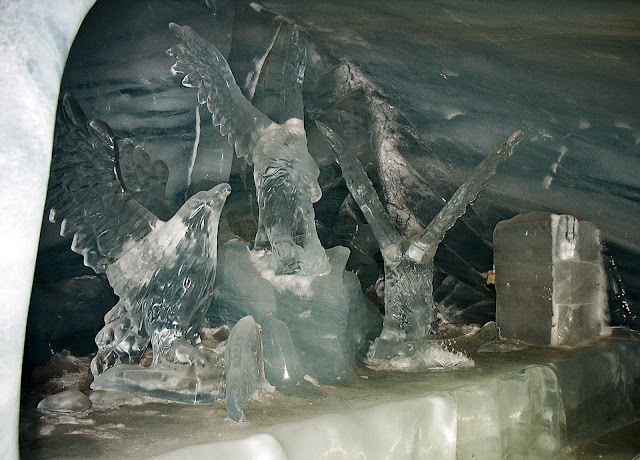 Here is an ice sculpture of birds inside the icy palace. 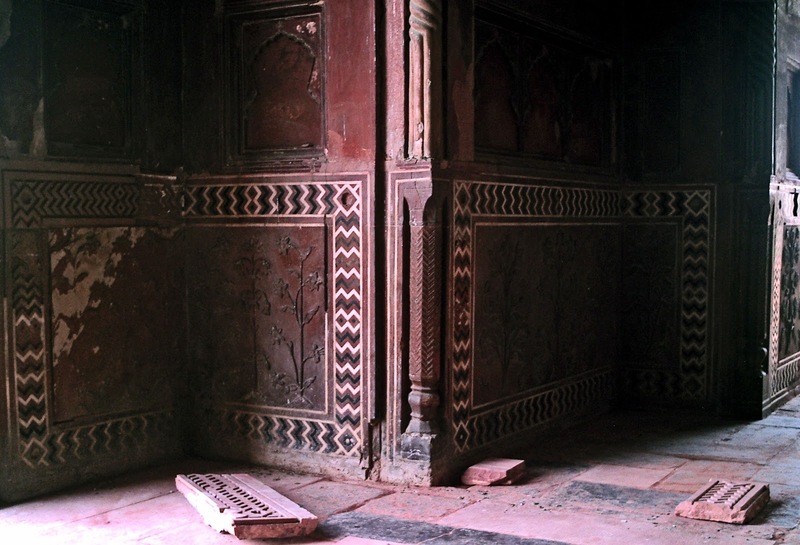 The picture below gives you an idea as to how thick the walls and the ceilings are. Taj Mahal, one of the wonders of the world, is strikingly beautiful on the inside as it is on the outside. Here are some of the designs and motifs from inside of the Taj Mahal. Various methods were used to decorate the walls and doors and domes. Paint, stucco, stone inlays, patterned tiles as well as carvings were used. 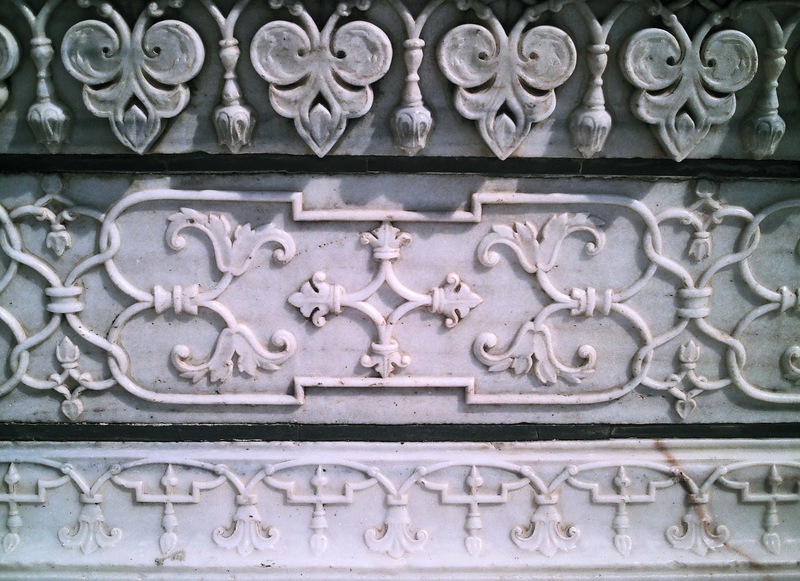 As Islam does not allow human or animal forms, decorative calligraphy and abstract, geometric or plant patterns and motifs were used. The method depended on the surface of the area to be decorated. 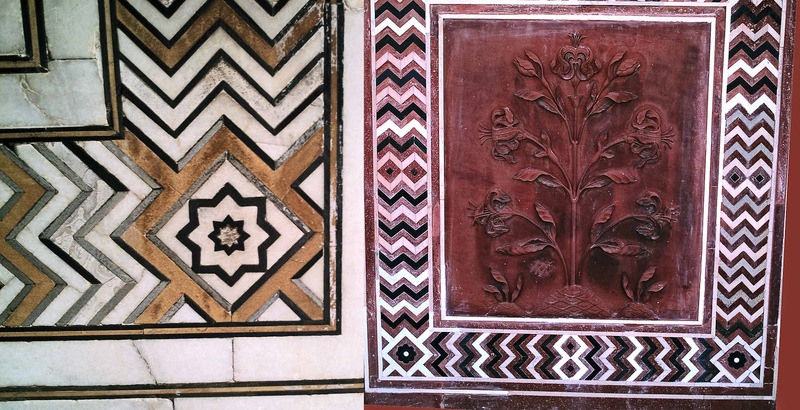 White inlays were used in on red sandstone buildings and dark or black inlays on the white marble backgrounds. 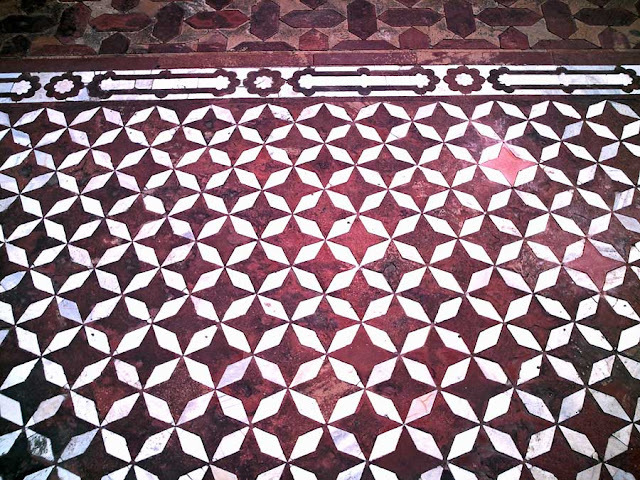 At times designs were created using contrasting paints, creating geometric designs. 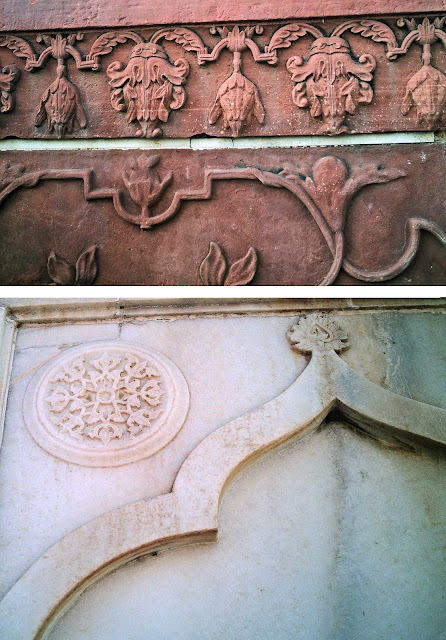 Motifs of plants and flowers were used to create intricate designs above doorways and arches. 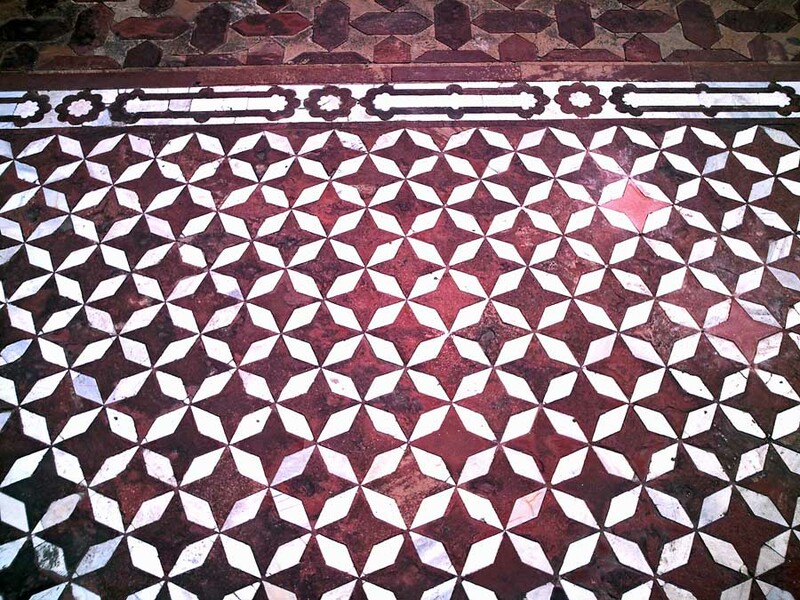 On floors contrasting tiles or blocks created striking patterns. 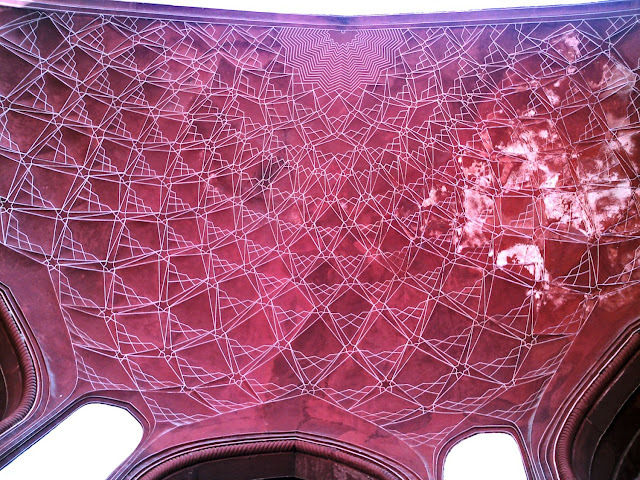 Here is an example of a ceiling of a dome of a sandstone building where the incised art (cut into the surface) created intricate geometric patterns. Marble was carved into pretty flowery shapes. 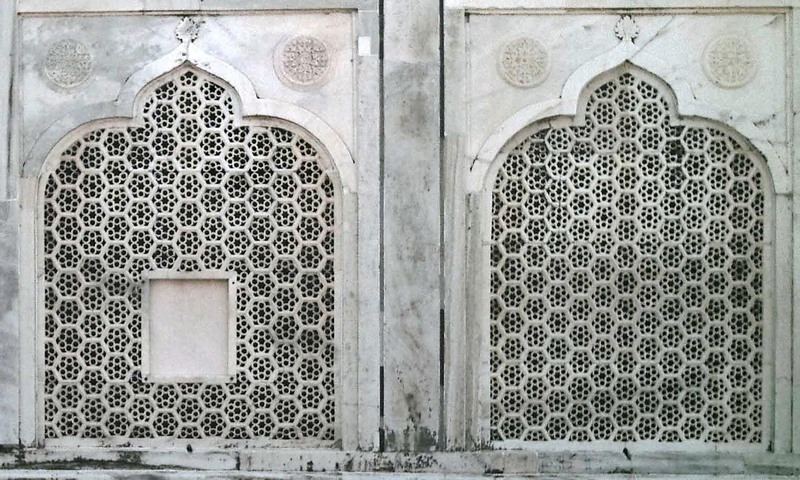 These are the two huge marble doors/windows at the Taj. The photo is taken from the outside. 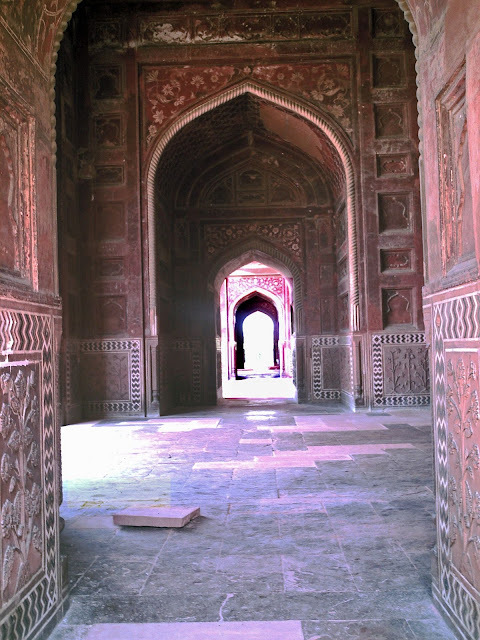 The painstaking work involved becomes clear when one sees the enormity of the Taj Mahal and the various arches, doorways, ceilings and floors which were decorated. In the pictures below two different designs from different areas have been included in one image. In the picture below the design on the left is a close-up of the marble design seen in an image above. 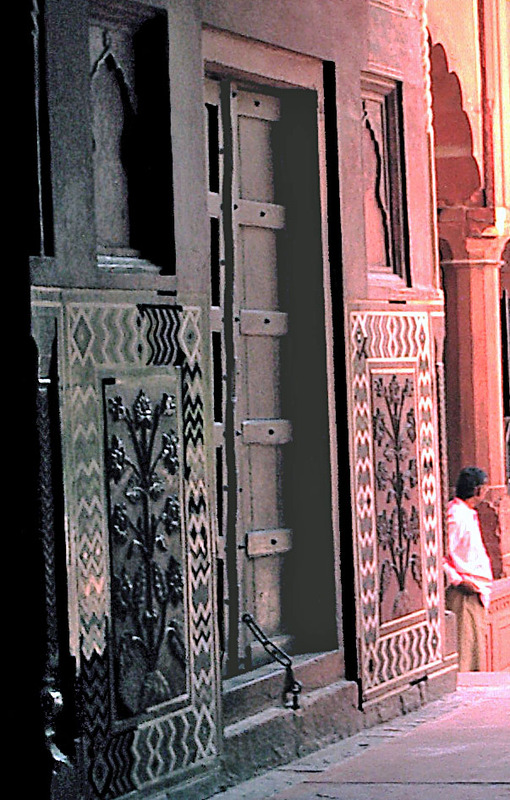 The dark metallic pattern on the right is part of a doorway. 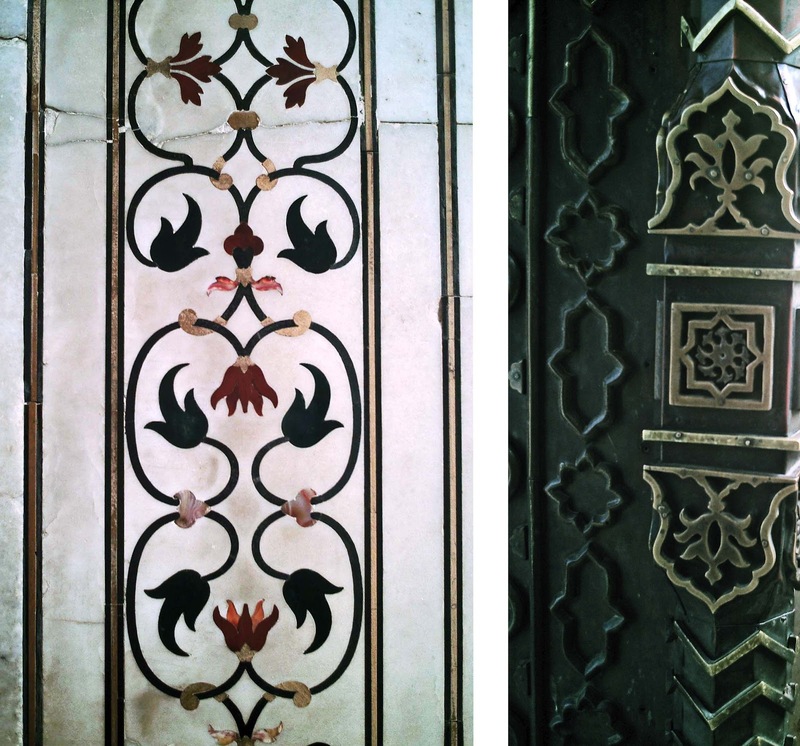 The brown and black design on the left is a close-up of the geometric pattern used to decorate the marble. The sandstone slab on the right shows flowers and leaves with a geometric border on a red background. Here again are close-ups of two different designs. 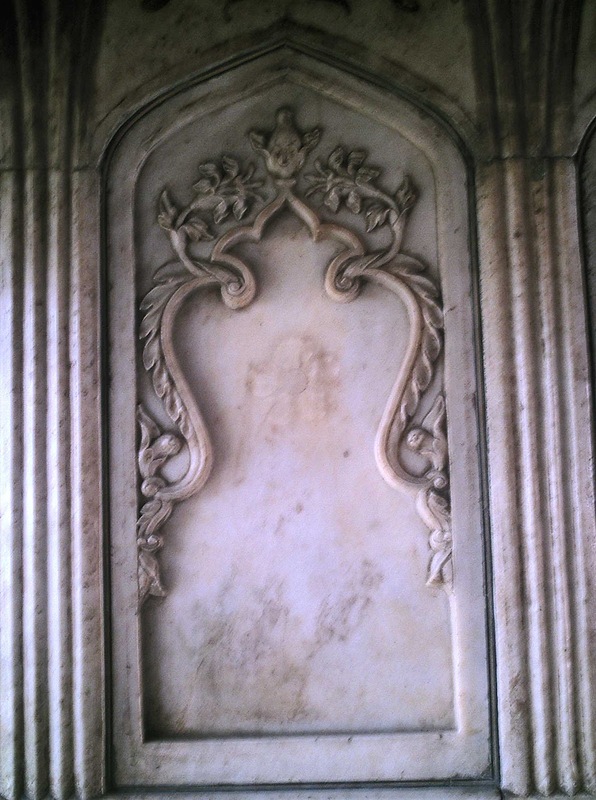 The first image is a part of a wall, at the bottom of it, and looks like a high ledge. 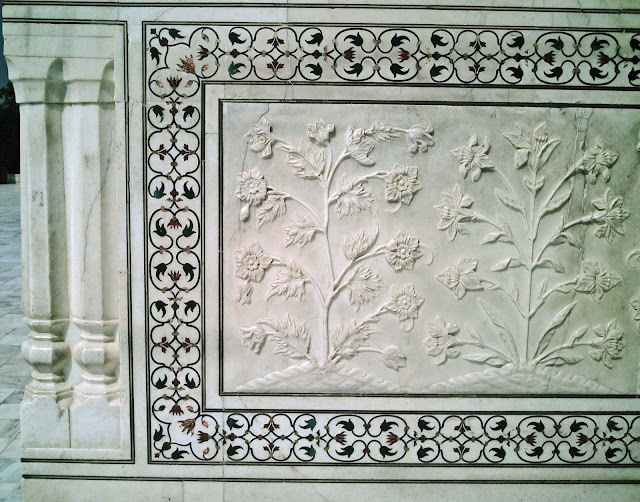 The image below that is a marble design on the wall of the Taj.